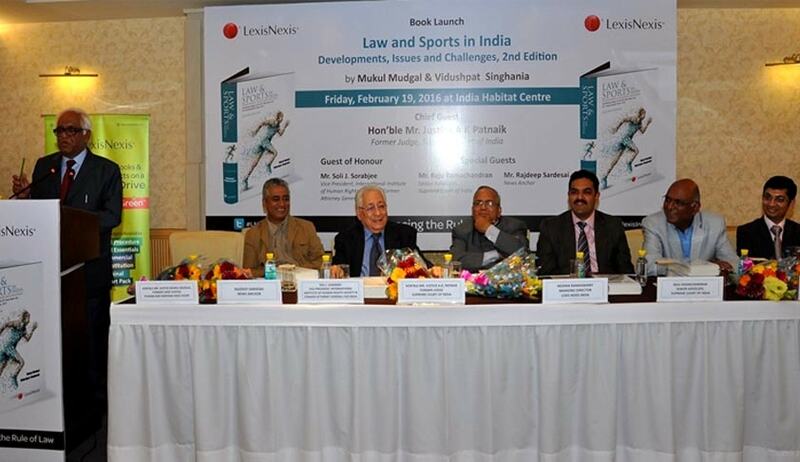 LexisNexis®, a leading provider of content and technology solutions for legal, corporate, tax, academic and government markets, launched ‘Law and Sports in India-Development, Issues and Challenges, 2nd Edition’ by Justice Mukul Mudgal & Vidushpat Singhania at India Habitat Centre, New Delhi, on February 19, 2016. Hon’ble Mr. Justice A K Patnaik, Former Judge, Supreme Court of India, who was the Chief Guest of the function, released the book in presence of eminent dignitaries like Mr. Soli J. Sorabjee, Vice President, International Institute of Human Rights Society and Former Attorney General for India; Mr. Raju Ramachandran, Senior Advocate, Supreme Court of India, and Former Additional Solicitor General; Mr. Rajdeep Sardesai, eminent Journalist and News Anchor; and many serving and retired Hon’ble Judges from the Supreme Court of India and Delhi High Court, as well as senior advocates, corporates, academicians, and media professionals. While welcoming the guests and other dignitaries present, Mr. Mohan Ramaswamy, Managing Director, LexisNexis India, said, “Sports overtime has evolved from being a source of personal entertainment to being a big commercial industry around the world. An industry worth several billions with an all-encompassing worldwide presence is bound to raise its own disputes. This perhaps has resulted in the growth and development of sports law as a separate regulation in its own right. The book examines the position of sports within our constitutional framework, the upcoming sports policies, the increasing commercialization of sports today and the challenges faced by sportspersons, event organizers and sports federations. The authors, with an aim to raise awareness about vital legal issues in sports, have taken into account decisions of the Indian judiciary as well as courts worldwide. This book will be of interest to lawyers, judges, regulatory bodies, sportspersons, sports administrators, sports institutions and most of all, sports lovers,” he added. On the occasion talking about the book, Mr. Soli J. Sorabjee, Former Attorney General for India, said, “I will not call it a book but an encyclopedia. It covers various aspects of sports law; especially the chapter on judicial review is quite insightful. There are chapters on IPL probe report, doping controversies and related cases, and gender discrimination; it also raises concerns about nationality in sports and unresolved questions relating to broadcasting law and taxation of earnings from sports. The book is a monumental work on sports law that will help one in understanding sports law better. ” He also wished the best of luck to the author and the publisher, LexisNexis, for bringing up the 3rd edition soon.